Musings from the Desk, Stove, Table and Counter: SUMMER --and lovin' the CSA! Mediocre advice from a Housewife, Mother, Bookkeeper, Payroll Specialist, Gardener, Jewelry Designer, Seamstress, Knitter, Cook, Decorator, Tool Saleslady - and most recently - Food Bank Coordinator. 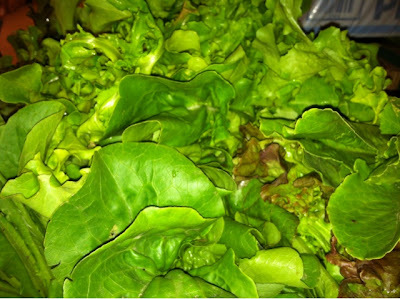 SUMMER --and lovin' the CSA! Wow. I didn't realize that it's been this long since I've posted something. Summer has been crazy, with a million things to do. But a highlight of our summer for the last three years has been our weekly CSA share! CSA stands for "community supported agriculture". I'd love to be able to grow awesome vegetables but all I seem to produce is a small quantity of tomatoes. Signing up with a local farmer is great. 3) we are supporting local (usually young) farmers! 4) it's a surprise and a challenge every week! 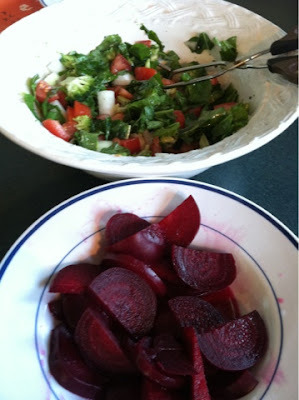 Arugula, tomato, onion salad and honeyed beets, all from our share! So here's a shout out to our local farmers: http://www.deep-roots-farm.com/ Marci & Greg, you are the best! This week we had two fennel bulbs in our share. So tonight's salad was ORANGE, FENNEL & ARUGULA! Tear arugula, place in bowl with sliced orange, fennel and green onions. Toast the almonds in the olive oil in a small frypan until slightly brown. Allow to cool. Add orange juice to almond/oil mixture and blend well. Sprinkle veggie/orange mixture with salt and pepper. Pour dressing over and toss. Sorry - the Hubby ate it before I could take a picture! The Tool Lady - My Tomboy Tools Website! ©2012 Bev Bafus. Powered by Blogger.